Comedian Trevor Noah brought a wry smile to his fellow South Africans during the Oscars when he poked fun at white people in Xhosa, one of his country’s official languages. Noah, host of the award-winning Daily Show and son of a Xhosa-speaking mother and a Swiss-German father, often uses South African languages in his stand-up routines. Noah proceeded to speak in Xhosa, a language spoken by more than eight million people, and translated the phrase into English as “in times like these, we are stronger when we fight together, than when we try to fight apart”. But Noah’s comment actually meant “white people don’t know I’m lying”. Black Panther, the story of black superhero King T’Challa which is set in the fictional African kingdom of Wakanda, lost out on the best picture award to Green Book. Within hours, Noah was one of the top trending topics on Twitter in South Africa where members of the black majority often poke fun at their white compatriots for not speaking African languages. “Trevor Noah really stood on a Global stage and told a joke only South Africans could immediately chuckle at. I know a Greatest Of All Time when I see one,” wrote South African Twitter user Wally. “Hilarious!! !” posted psychologist Suntosh Pillay. Serame Kibi said simply “Trevor Noah made it”, calling the entertainer a “very classy individual”. Noah, who grew up in the township of Soweto, shot to fame in 2015 as the surprise choice to host the nightly satire show, taking over after Jon Stewart’s celebrated 16-year stint. A child of a then prohibited relationship between a black woman and a Swiss father, Noah has often joked about his upbringing as a mixed-race boy among black children in Soweto where both Nelson Mandela and Desmond Tutu once lived. 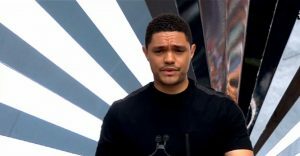 The post Trevor Noah’s Wakanda Oscars routine comic relief for S Africans appeared first on SABC News – Breaking news, special reports, world, business, sport coverage of all South African current events. Africa's news leader..